September 14, 2014 - In this sermon, Fr. Vazken candidly talks about cancer as a "cross that needs to be elevated" from the hiding. This is an expression of the crosses and the disease that menaces our lives on a personal level and globally. He brings relevancy to the healing claims of Christianity for today. Recorded LIVE at the St. Peter Armenian Church in Glendale California. Labor Day 2014, Fr. Vazken preaches this sermon about our work and labors, anxiety and stress - finding a path to enthusiasm and purpose. 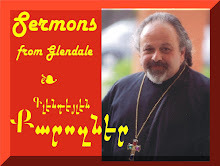 Spoken and recorded LIVE on August 31, 2014 at the St. Peter Armenian Church Youth Center, Glendale, CA.